The green velvet cupcakes not only look delicious but are a beautiful shade of green for an Irish tea. I like the books you picked up in Ireland, I brought back some nice treasures myself last year. A great find with the teapot and the teacups have a unique shamrock design. See you at the crawl. Love your tea pot and the tea cup! Cute tasters also. I could go for a cupcake right now! Wow, they look delicious! So does everything ~ the lucky 'testers' enjoyed it by the look of it! What a beautiful post, Kitty. Love the tea cup and tea pot, I am sure those cup cakes just melt in your moth, and your helpers are all quite cute! A great job. Oh, Kitty!! That teacup makes me want to start a collection. How perfect is that pattern for St. Pat's?? The cupcake looks delicious and it must be, since the faces of your helpers show nothing but pure delight!! 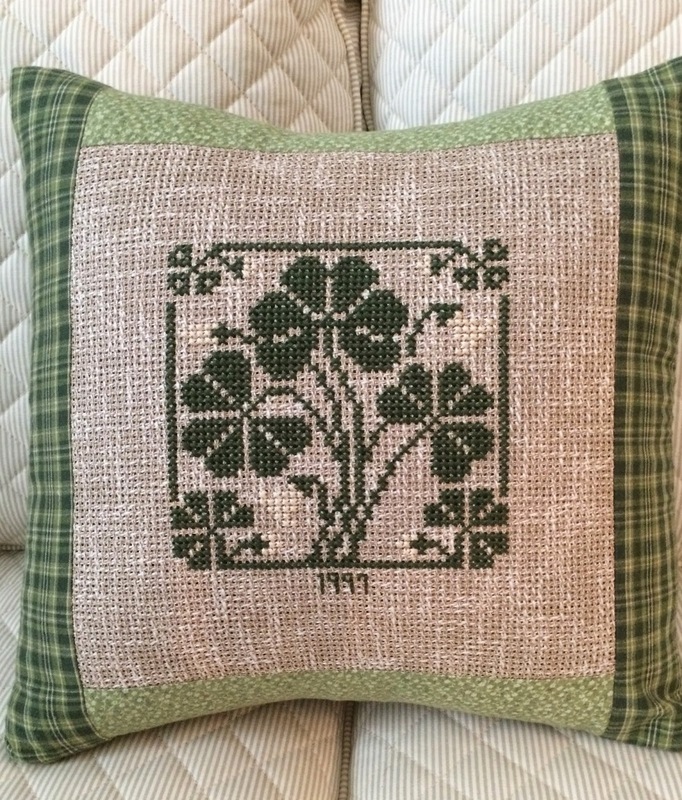 Also, how smart of you to add that pillow with the shamrocks - such a wonderful touch!! I adore that little teapot, the crazing is charming! What darling taste-testers you have! What fun to have green velvet cupcakes! Thanks for the recipe. Fun teapot! Kitty, I'd gladly join that group of tasters. Those cupcakes look delicious. Thanks for the recipe! Glad that teapot found you. It's truly special. I'm really impressed with your pretty shamrock pillow. I love to work on linen, too. Happy St. Pat's Day! Kitty, You have a cute group of helpers. I would enjoy a cup of tea and a cupcake with you. Are there any left! I do adore the sweet plate your Mom gave you. 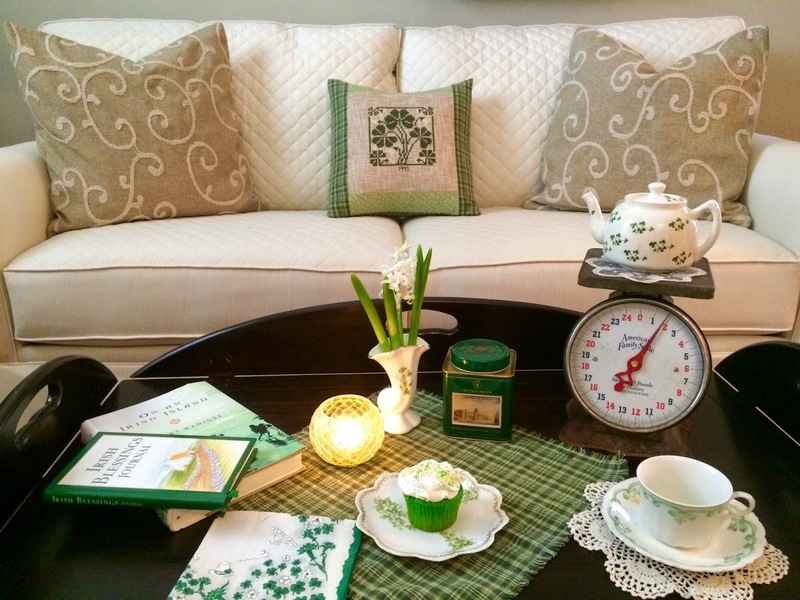 Darling teapot too, but my favorite is your hand stitched shamrock pillow. Oh Kitty I do love that tea cup set you got. I bet it's extremely rare. Those cupcakes are fabulous in color and I'm betting taste wonderful! You've got a good crew of taste testers! The pillow looks in perfect condition- great pattern! Have a Happy St. Patrick's Day! My kids would go crazy for those cupcakes. What a fantastic idea! Pinning this for later! A favorite post. The tea cup is wonderful! And the teapot is so like one my mom made me yeeeeeears ago! It just died - cracked in half and fell to pieces. Spontaneously. It was just sitting there on the counter waiting for it's bath and I was talking on the phone about how maybe I shouldn't use it for tea any more, perhaps it could be a planter or a bird house and crackled in half and that was that. The green cupcakes look great. Very festive. I love that plate with the gold trim Kitty, all your pieces are so pretty! I've seen a few recipes for green velvet cakes floating around and it sounds like a perfect spring treat! Your taste testers look very happy! Kitty, I would love one of those beautiful cupcakes and share a cup of tea or coffee with you. I love your pretty tea pot and the pattern on the cup and saucer. 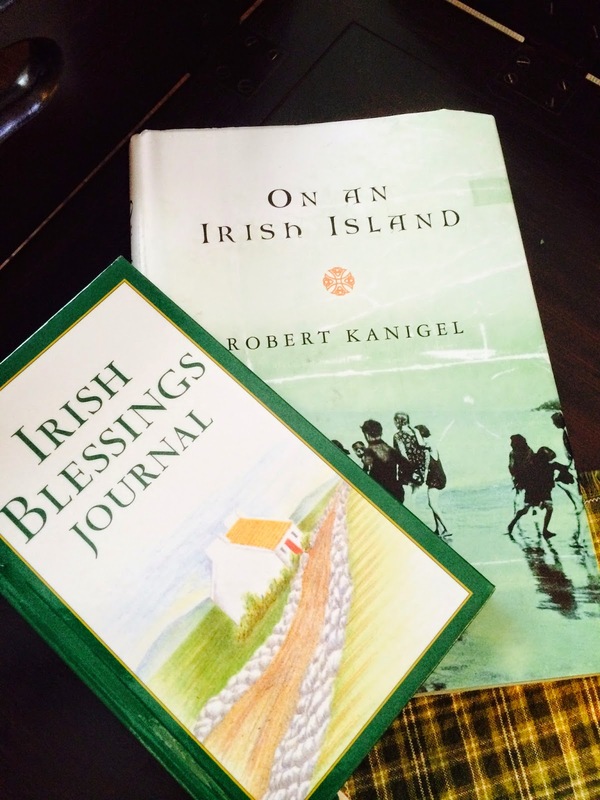 I would also love reading the Irish Blessings book, just love them too. The pillow is a great way to enjoy your cross-stitch. I see you had a darling group of helpers for the cupcakes! I love your post...Those green cupcakes are fabulous..and the china teacup, well, I am off to search out that pattern. It is beautiful..
Have a good St Patrick's Day.. Your ebay china is gorgeous, Kitty! I'm surprised the woman would sell china that had been in her husband's family. Maybe they didn't have any family left who wanted it. Great purchase and I know you will cherish it for them :) Love the Green Velvet Cupcakes! WONDERFUL post, Kitty! I have had company all week and haven't done a single St. Pat's post and not sure I am going to be able to...going to try! Your china is absolutely stunning and I absolutely must make those cupcakes, golly my mouth is watering...and they're SO PRETTY! Kitty, I found your delightful blog through your comment at Antiques and Teacups. I love your tea things! That wonderful teapot with the crazing was quite a find. I would be very happy to join you and at the moment a cupcake sounds divine as I am craving a sweet. What a pretty Irish tea you created. The Green Velvet Cupcakes look like they were a hit! Lovely post, Kitty! I love that teapot too, scars and all! The cupcakes look delicious. You did a beautiful job on that pillow, love it! Thanks so much for joining in the ♣ Blog Crawl, you are a dear! Happy SPD! Hi Kitty, Boy that cupcake looks delish!! That's me -- always thinking about the food. ;) I LOVE, LOVE all your pretty china pieces. What a great find on the teapot, but that cup and saucer -- oh my!! I love the Celtic knot pattern in the center! You have a wonderful collection of teapots, cups, and saucers that you can use for tea. I might have to start a collection myself. Your pillow is lovely, and you did a great job on it. Thanks for kindly sharing your recipe with us, Kitty. I love your whole table setting and wish you a Happy St. Patrick's Day! Thanks so much for your visit to my pub table and have a great weekend! Beautiful teapot and china...love it! The cupcake looks great. Everything you have gathered together makes for a perfect St. Patrick's Day table. I love your tea pot that you found and the tea cup is so pretty too. The doily is pretty. Your snack treat is great. And I love your cross stitch pillow. 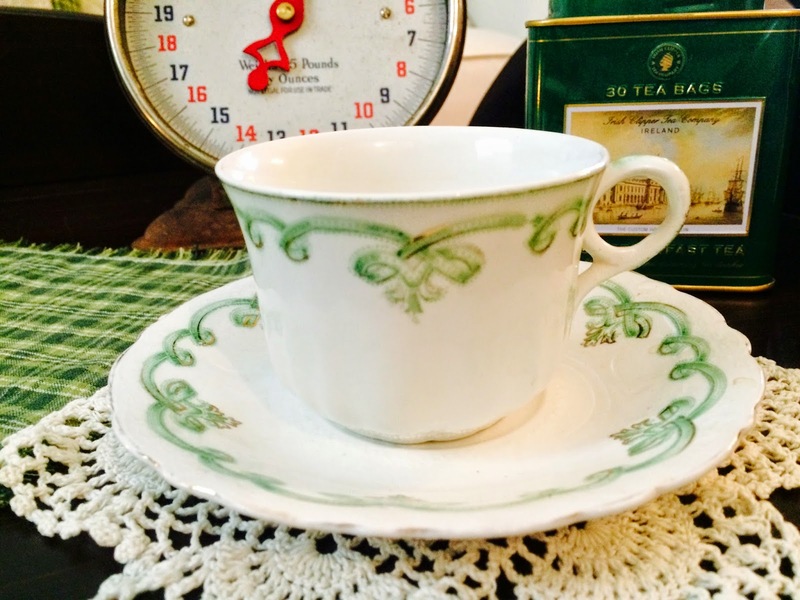 Kitty, I am in love with the Rolland pattern teacup and plate from Johnson Brothers, it is lovely and so perfect for Saint Patric's Day. The teapot is very pretty too. The cupcakes look wonderful and your tasters look very happy eating their cupcakes. Kitty, you know I like that tea cup set, it is green...and the pattern is so beautiful. 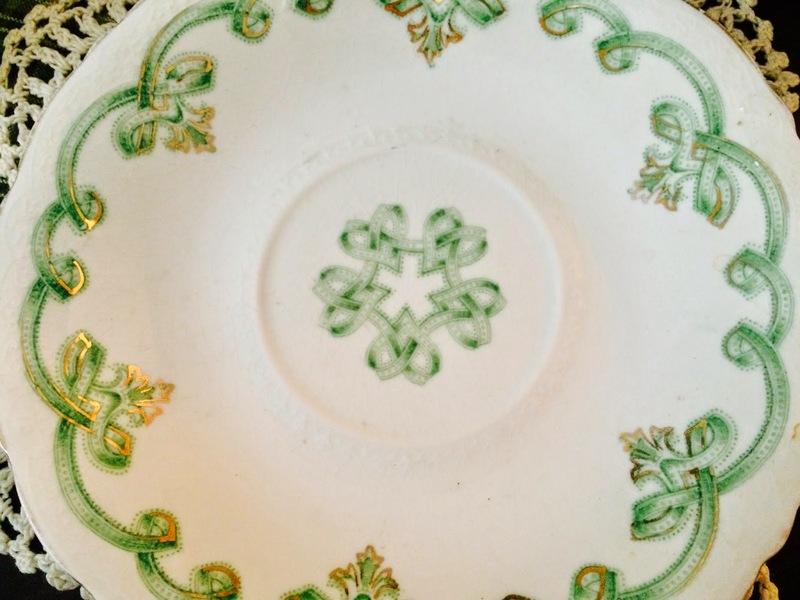 I would love to come across some plates in that pattern. It looks like your taste testers are really enjoying themselves! I love both the teapot and teacup Kitty! The cupcakes sound delicious and the tasters do look very happy. Thanks for sharing with SYC. Oh Kitty...don't those cupcakes look delicious...and if you check out the taste testers...I guess that's a YES! So fun! Love your pretty setting too! Thanks for linking to Tuesday Cuppa Tea! What a great Irish Post with all things Irish! Happy St. Patrick's Day and thanks so much for sharing with Full Plate Thursday! I knew you would have my mouth watering! Green velvet cupcakes ... who knew???!!! Perfect for St. Patrick's Day. Your teapot is a real treasure and I love the teacup. You have some very cute cake tasters! Happy St. Patrick's Day and Happy Tea Day! Love your shamrock pillow, Kitty! It's the perfect accessory for the holiday. Your green cupcakes look wonderful and are such a pretty treat for St Paddy's Day. The teapot is adorable and I love the teacup and plates. Your posting is a very festive one especially having included your charming family. Thank you for joining me for tea and Happy St Patrick's Day, sweet friend! I am quite smitten with both the Tea Pot and the Cup and Saucer!!! I adore how you made a pillow out of your cross stitch art. . .
it was the first thing to catch my eye in your post!!! Happy St. Paddy's Day, Kitty! I would love to try your green velvet cupcakes. 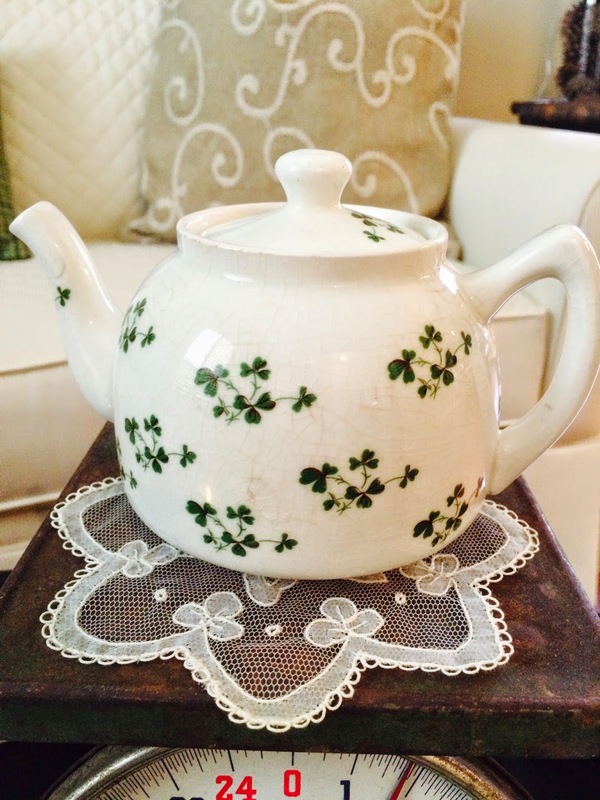 You definitely can't beat the $1.50 price for your cute shamrock teapot! Stopping by this St. Pat's morning to wish you a happy St. Patricks Day. I didn't do a thing for the holiday this year. Not. A. Thing. Clearly what I need to jumpstart my creativity is a trip to your blog for a recipe or two. The green velvet sounds and looks divine. I'm a huge white chocolate fan so that's an extra perk. Your tasters are the best part of all. What a wonderful teapot. And those muffins, oh my. They look divine! Good evening, sweet friend! I am late to the tea party, but I hope there is still tea and sweets left :) If not, that is okace because just visiting with you is a blessing and joy. Your tea time is lovely and the tea cup that you found on Ebay is simply lovely! The history behind it is quite sweet too. Your pillow is beautiful, dear Kitty! You are so talented and your hands create lovely items. Thanks for sharing with Roses of Inspiration. I am so glad you join the party every Tuesday. Love and hugs! Hi Kitty! Happy St. Patrick's Day! Your tea is so pretty, and that cup is terrific! I can see why it is a favorite. Those cupcakes look great and so green and cheerful. Great job with that pillow too, but the way, it is the perfect match to your tea :). Wow Kitty - you do have lots of comments. I think everyone adores your baking skills. Especially your grandkids! I love your teapot with the crazing - per charm. Also, I noticed the hanky! Every cute! Hi Kitty! Over from ROI! Everything looks lovely and I will have to make those cupcakes! They sound lovely! Beautiful table setting. Such a pretty green! I have to take cupcakes to a funeral this weekend and I am going to make this frosting! It sounds wonderful. 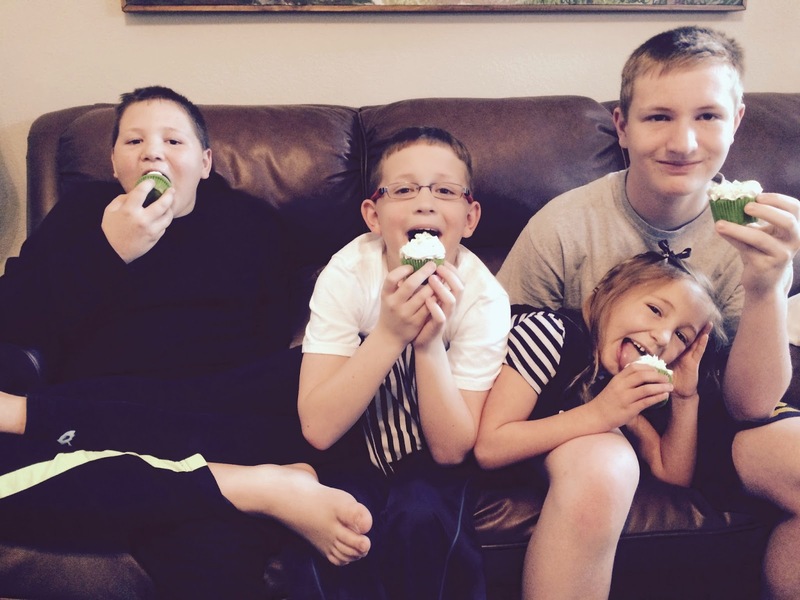 Love the picture of the kids enjoying the cupcakes! Hi Kitty, Happy Belated St. Patrick's Day. I love your tea pot and the cross stitch pillow. The cupcake looks so cute green and perfect! Thanks for sharing the recipe. Have a nice Friday and weekend. GREEN Velvet! How FUN! I do hope you had a great St.Patrick's day! So pretty, I just love your pot and pretty cups. The cupcakes look terrific, and love your stitched pillow!